Several species of Sambucus are well known, especially S. nigra, which is native to Europe, and S. canadensis from North America. The flowers, or cymes, are the parts that are most favored in herbal therapy; the berries, bark, and leaves are used less frequently. Uses and Benefits: In Europe, elder flowers have been popular for treating colds and fevers, and to help expectoration in bronchitis and asthma. Elder is commonly described as being a diaphoretic. It is often incorporated in herbal mixtures to treat influenza, sinusitis, and bronchitis. Other recommended uses include neuralgia, nervous conditions, inflammatory diseases, rheumatism, diabetes, and various infections. It is also employed as a laxative, a diuretic, for weight loss, and as a topical preparation for skin disorders. The blue or black berries are used as a food, in wine and other drinks, and in jams. Its popularity today relates in large part to its importance in traditional European folklore, where it is credited with legendary properties. 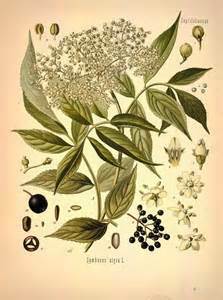 Elder flowers are a mild astringent and are used in skin washes to refine the complexion and help relieve eczema, acne and psoriasis. Flower water makes a soothing gargle and when strained makes an excellent eye wash. The leaves and flowers are a common ingredient in ointments and poultices for burns and scalds, swelling, cuts and scrapes. Infusions and preparations with the blossoms combined with other herbs have also been used to quicken recovery from the common cold and flu. *Elderberries are made into elderberry wine, jam, syrup, and pies. *The entire flower cluster can be dipped in batter and fried. *Petals can be made into a fragrant and tasty tea. *The flowers add an aromatic flavor and lightness to pancakes or fritters. *Elderberry twigs and fruit are employed in creating dyes for basketry. These stems are dyed a very deep black by soaking them for a week or so in a wash made from the berry stems of the elderberry. *Elderberry branches were used to make the shaft of arrows. Flutes and whistles were constructed by boring holes into stems hollowed out with hot sticks. *Musical Clapper sticks were made by splitting the stem and clapping the two halves against each other. *The pith of the stems was used as tinder, and the stem itself was employed as a twirling stick for starting the fire. *The flowers are the mildest part of the plant and prepared as a tea, are used to break dry fevers and stimulate perspiration, aid headache, indigestion, twitching eyes, dropsy, rheumatism, bladder or kidney infections, colds, influenza, consumption (bleeding in lungs), and is helpful to newborn babies. *Used as a wash, the flowers or leaves are good for wounds, sprains, and bruises. *The leaves, which are stronger, have a slightly laxative property. *Applied externally, leaves, flowers, bark and twigs are excellent as a poultice, mixed equally with chamomile, for soreness, inflammations, joint stiffness, and to reduce the swelling of bee stings. *The flowers and berries, employed as a diuretic, can aid arthritis and rheumatism. *Steeped in water, the flowers are used externally to aid in complexion beauty, tone and soften the skin, and lighten freckles or spots. *The berry juice made into salve aids burns and scalds. Mix all the ingredients and allow to steep overnight. Strain and bottle into sterilized bottles. Open after 1 week to release air and then reattach lid. Enjoy after 2 weeks. Disclaimer: The pages in the Plant Profile section present a description and history of the medicinal uses of these plants. The intention is not to provide specific medical advice. You should consult your personal physician or health practitioner before taking any form of herbs or medication.